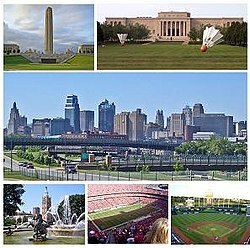 綽號："KC", "KCMO", "泉城（City of Fountains）", "國家中心（Heart of America）"
^ Census Bureau Estimates Program (2005). [2006-09-11]. ^ Annual Estimates of the Population of Metropolitan and Micropolitan Statistical Areas: April 1, 2000 to July 1, 2005 (CBSA-EST2005-01). [2006-09-11]. ^ Census Bureau Estimates Program (2006). [2007-07-29]. ^ 6.0 6.1 6.2 6.3 6.4 6.5 6.6 6.7 NowData – NOAA Online Weather Data. National Oceanic and Atmospheric Administration. [2011-12-17]. ^ Station Name: MO KANSAS CITY DOWNTOWN AP. National Oceanic and Atmospheric Administration. [2014-03-13]. ^ Kansas City Daily Climate Records/Normals. National Oceanic and Atmospheric Administration. [February 12, 2011]. ^ Station Name: MO KANSAS CITY INTL AP. National Oceanic and Atmospheric Administration. [2014-03-26]. ^ WMO Climate Normals for KANSAS CITY/INTL ARPT MO 1961–1990. National Oceanic and Atmospheric Administration. [2014-03-11].